I was turning my compost pile with a shovel one day last summer when I saw what looked like a tall weed. I pulled it out from the earth only to discover it was a sprouted avocado pit! Intrigued, I planted it in a pot where it thrived, until the cold of our BC winter killed it. I've been meaning to try growing one again, but this time with indoor potting soil so that I can keep the plant warm in the house this winter. I debated whether or not to simply fill a pot with potting soil and put the pit in it (because that apparently works! ), but then I thought I'd do some Internet research on the topic. Voila! 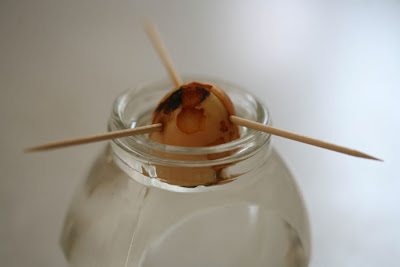 The toothpick suspension water sprouting method! (See picture). Clean the avocado pit and remove the thin skin. Make a slice down one side of the pit. Suspend the pit with toothpicks so that the narrower part of it is above the water and the wider part is below. Check water daily to ensure that the bottom half of the pit is still touching it. The trick to growing avocado plants indoors is adequate sunlight - bright windows are best. I have mine on my kitchen window sill overlooking our sunny back yard. I'll post more pics as it grows!